Mimaki today announced that it will be heading to Messe Düsseldorf for PSI 2017. It is the annual event for the International Network of the Promotional Product Industry and is the leading European promotional products trade show. Approximately 16,000 visitors from more than 80 countries will meet well over 900 exhibitors from more than 35 nations at this annual event. Mimaki will be located in Hall 12, Stand B13 at the show with a variety of technologies that enhance or add value to promotional products. Image left: printed glass bottle & customised packaging: Apart from printing on a wide range of materials, including glass, Mimaki also offers print and cut solutions for customised packaging. Image right: Promotional Items: various promotional items printed by Mimaki printers. 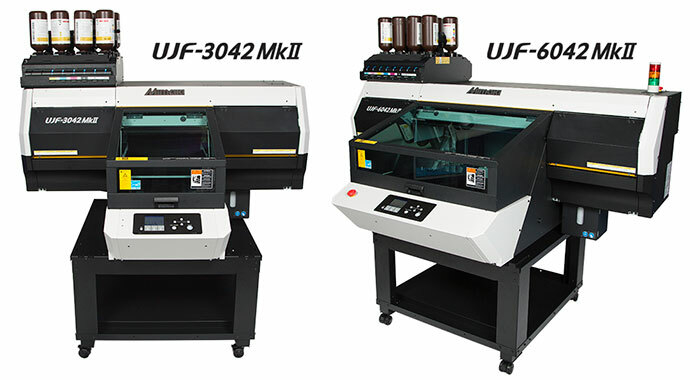 UJF-3042 MkII: This UV flatbed printer features a compact table size of 300mm x 420mm and can use a wide range of Mimaki inks to enable exceptional quality printing on a variety of different types of promotional products on materials up to 153mm thick. 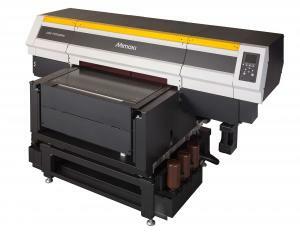 UJF-6042 MkII & CFL-605RT: This Print & Cut solution combines Mimaki’s new flatbed printer (with a table size of 610mm x 420mm) with the CFL-605RT flatbed cutting plotter. This compact, versatile, multifunctional solution is ideal for printing and cutting PET or other plastics using its wide range of cutting functions. It includes a powerful cutting software plug-in package that makes it easy to use and minimises opportunity for error. UJF-7151 plus: This powerful and reliable digital printing alternative to traditional direct-to-object screen printing will be shown producing two different applications. One printer will use LUS-350 flexible ink in a digital thermoforming application, shown together with Formech 508FS vacuum forming machine for a complete digital thermoforming solution. Mimaki LUS-350 is a unique ink that can stretch up to 350% and is suitable for a wide range of thermoforming applications, especially those requiring exceptional hardness and durability such as automotive parts. A second UJF-7151 plus will be shown with LH-100 ink, a rigid ink formulation for printing on hard surfaces requiring greater adhesion properties. CJV150-75: This integrated printing and cutting system will be shown with silver ink, creating applications such as promotional labels and stickers. It is available with multiple solvent ink sets, with up to 10 colours to choose from, including silver, orange, light black and white inks, delivering extremely high quality with a robust colour gamut.